On December 21, 2018 the USDA released the disclosure standards for GMO food labeling. It was not a happy day for those of us who want transparency in our food supply and full disclosure of genetically modified ingredients. The only bright side is that organic certified foods are always non-GMO. So if you are looking for foods or ingredients that do not contain genetically engineered ingredients, buy organic. Here are some of the major points of contention with USDA’s GMO food labeling rule otherwise known as the National Bioengineered Food Disclosure Standard. Highly refined oils and sugars from GM crops are exempt from GMO labeling requirements. This means that foods that contain high fructose corn syrup, refined soybean oil and sugar from sugar beets do not have to disclose genetic engineering on the label. USDA’s reasoning is that modified genetic material is below detectable levels. This exemption creates a loophole for up to 2/3 of all GMO products. However, USDA will allow manufacturers to make voluntary disclosures on such products in the interests of transparency. The Center for Science in the Public Interest noted that, "By making the disclosure of this information voluntary, consumers will be confused when one product voluntarily discloses that is it “derived from bioengineering” and an identical product has no such disclosure." 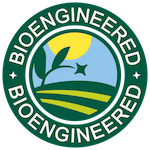 The rule changes the highly recognized “non-GMO” or “genetically modified” wording to “bioengineered food.” In the interest of transparency, the USDA should have required language that people are familiar with, not new language. The ways of making a disclosure are disappointing. The symbol that can be used on package to alert consumers to a genetically modified ingredient depicts a happy farming scene. Is this how GM crops that can be liberally sprayed with toxic glyphosate that ends up in our foods should be pictured? Besides the symbol, companies can use a scan code or provide a text number to bring people to more information. This means no disclosure for those without a mobile phone or good cell service. On-package information is not exclusive. To get full disclosure of genetically modified ingredients, let the brands you buy know you want clear labeling on their packages! For more information on the shortcomings of this rule visit http://www.justlabelit.org/usda-rule/. For your reference, these crops are available in bioengineered form throughout the world. Foods on this list must be disclosed unless records are available to demonstrate they are not bioengineered or they are exempt under the USDA disclosure rule.